Okay, now we’re getting somewhere with this passive income thing! If I could make $5k consistently every single month from my business, I would be over the moon happy! So, what, exactly, was responsible for my best month to date in business? Let’s dig in and find out! I wanted to briefly mention again that everyone’s journey to entrepreneurship looks different, and that’s okay! I want to be clear right out the gate that I do not have an instant-success story. It took me YEARS of trial and error, failure, small wins and constant pivoting to get to this point. Back in 2014, my boyfriend and I made the decision to both start businesses at the same time (he’s a realtor). For the first few years, I shouldered the majority of the income generating burden and did not have the luxury of jumping 100% into my nutrition business right out of the gate. Instead, I worked a variety of side jobs to keep afloat and was working pretty much every day of the week. It was really tough to feel like my dreams were on the back burner, but eventually, it started to come together. It took a little time, patience, and experimentation to figure out a way to make it work for ME, but it was worth it. And you can do it too. I’m sharing my story in the hopes that some of you will see yourself in my journey, and continue to push for your dreams, even if they happen more slowly than you were hoping or expecting. It’s never too late to get started, and it’s okay to go at your own pace. So as you can see, my largest single source of income was virtual clients, but affiliate income (which is relatively passive) was a close second!! 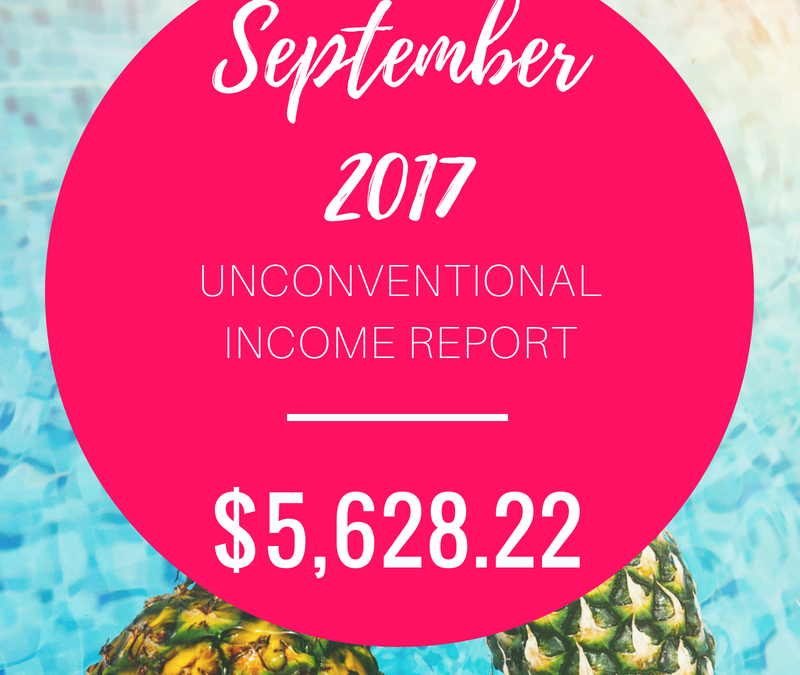 I also doubled my monthly revenue from the Functional Nutrition Library, so that’s a huge win. Overall, in September I started to feel like things were shifting, and I was really enjoying the work I was doing! Let’s dive into the deets. After having a relatively slow summer where I focused mostly on building the Functional Nutrition Library, I started to pick up my private practice clientele again. Since my ultimate goal/vision is to create a thriving online business, not a private practice, I have been seeing clients, but not putting very much effort into marketing or building connections/referral networks. If my intention was to build a full-time private practice, then I totally would be spending time on this, but instead, I chose to spend my extra time on blogging and building up my online ventures. So, this month I was working with 8 clients, which is a pretty good sweet spot for me. Not overwhelming, and leaves me plenty of white space in the week to work on other stuff. I really love the package model, because it sets the expectation for both me and my clients before we start working together. I’ve found that my clients are happier, we get better results, and are all on the same page while working together. It’s also great for stable income, since you know exactly what you’ll earn with each client you take on. Win win! In September I was selling 6-appointment packages for $1,000. They also included email support between sessions & some personalized recipe & shopping suggestions. To my surprise, I wasn’t having any trouble selling the packages (I also offered 3 month payment plans), and I really wish I had implemented this model sooner. Yessss!!! I was SO SO SO excited about this!!! If you’re not familiar with Heather Neal’s RD Entrepreneur Symposium (affiliate link), well, you should be! Twice a year Heather puts on an epic 3-day online event featuring over 20 entrepreneurial dietitians who want to share some tips to their success. You can sign up to watch the presentations, get tons of awesome bonus content, earn CEUs, and have access to the videos for a whole year. It’s GREAT! Each time the lineup and topics change, and I’ve been fortunate enough to participate in every iteration of the event since it started. The September 2017 symposium was the 2nd event, and I was super excited to speak about building, launching, and growing a membership site (which was especially timely, since I had just finished launching the Functional Nutrition Library). The first time I spoke at the event (in March 2017), I had JUST created the Unconventional RD Facebook group and blog, and had a very very small audience. At the time, I was thinking that even if I made just 1 sale through my affiliate link, I would be super duper happy and feel like the time I spent creating and recording the presentation was worth it. (In case you’re not familiar with affiliate links, they are special links that include a code in the URL that is unique to you. They also include tracking cookies that enable the website to tell which visitors you referred to the site. If someone purchases the product within the cookie-tracking window (usually 30-90 days), then you will get credit for referring that person, and earn a percentage of the sale. Affiliate commissions vary widely, but are usually between 15% and 50% of the sale price). WELL, during that 1st symposium in March, I ended up making over $800 in affiliate sales just by posting about the symposium in a FB group and emailing about it to my very small list of like 500 people (most of which were my recipe blog subscribers who didn’t really care about this type of stuff). So, going into the 2nd symposium in September, I didn’t really know what to expect but was excited at the idea of maybe making the same amount of income that I had earned from the 1st one. This time, The Unconventional RD Facebook group had about 1,000 members, and I had an email list of 123 dietitians who were interested in passive & alternative income (so, a much smaller but more focused list than ericajulson.com). SO, I posted about the symposium in my FB group and let people know that they could receive 6 months of FREE access to the Functional Nutrition Library if they signed up for the symposium through my affiliate link. I also announced that I was creating monthly e-courses to go along with the library on practical topics related to running a private practice in functional nutrition and that those would be included in the free 6-month membership as well. So, I sent out ONE teensy email the night before registration closed, letting them know about the symposium and my bonuses (MASSIVE FACE PALM!!!). I’m sure I missed out on a ton of potential sales by taking that approach. I was thinking that everyone on my list was also in my FB group, so I didn’t want to bombard them with info on the symposium. But the reality is, NOT everyone in your FB group sees every post, whereas ~50% of the emails I send out get opened and viewed. Even with those mistakes, this time around I was much more successful and made just over $1,800 in affiliate sales!!! That’s more than 2x the earnings I made from the 1st symposium, and definitely the most I had ever earned in passive income from just a few days of work (creating and recording the presentation, plus the time to promote it). This month I also dabbled in sponsored posts for the first time! I didn’t quite have a large enough readership or a niche enough audience to be an asset to brands directly (I had tried reaching out to some in the past, but didn’t have any success), so I signed up to create sponsored content through a company called Linqia (affiliate link). Basically, Linqia (affiliate link) acts as a middleman in the sponsored post process. Brands come to them with products they would like to see featured on blogs, and Linqia collects a database of bloggers who they feel would be good matches. If you sign up as a blogger in their system, Linqia will notify you whenever they have a campaign that would be a good fit for your blog. If you choose to enroll, they will tell you up front exactly what/how you are expected to promote the product, and how much you will be paid. Now here’s the catch with Linqia (affiliate link) – they pay based on CLICKS, not just a flat fee. So when you agree to participate in a campaign, they tell you exactly what they will pay you for X number of clicks + provide some additional money to cover the cost of any product you need to buy. If you don’t actually get the expected # of clicks, then you will be paid less, based on the % of the goal you reached. But if you go OVER the expected # of clicks, you don’t get any extra compensation. However, next time they offer a campaign to you, they’ll look at how many clicks you got on the last one, and readjust your payment and expected clicks based on that. So in theory, if you continue to grow your blog and perform well, your payment will continue to go up. Since this was my first campaign with Linqia (affiliate link) (promoting the TruRoots brand of quinoa), I was offered $60 for 75 clicks, + $20 to buy product. They also provided an electronic coupon to promote, which definitely helped with clicks. (For reference, for the next campaign they offered me $79.20 for 99 clicks, + a $50 product budget, so it was definitely going up). In sum, I received $80 total and was super excited about it! I also posted about Linqia (affiliate link) in my FB group, and had 5 people sign up for their own accounts, which earned me $25 in affiliate income. Sweet! Six dollars with Amazon associates this month was actually pretty good! I got the majority of people to click on my Amazon link by recommending my absolute favorite meat thermometer (affiliate link) in a blog post. I actually had 3 people buy meat thermometers (although cheaper versions). 3 people also bought monk fruit extract (not sure where that came from), and 1 person bought vanilla extract. LOL. 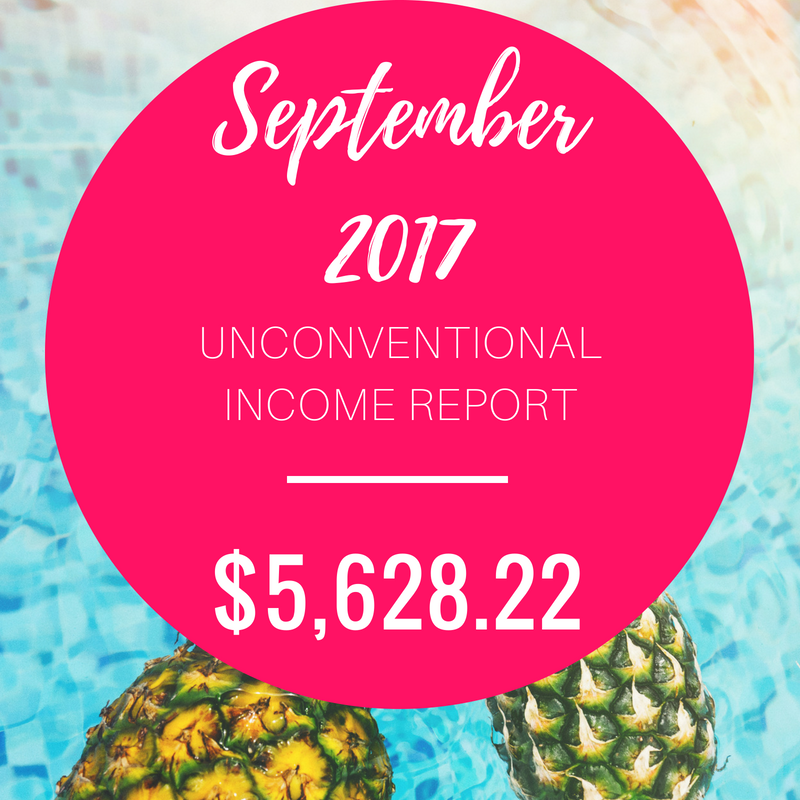 This was a crazy month for random additional income, and I was just saying yes to all of it! I was approached by a corporate wellness company who was looking for a dietitian to work a booth at a 2-day wellness event. We agreed on a rate of $75/h for 8 hours of work + reimbursement for any food props I bought. This was actually taking place RIGHT before I was going out of town for a wedding, but I decided to do it anyway because the money was good 🙂 The event was pretty easy, and I had a great time! Of note – they found me via my HealthProfs profile, so that’s yet another perk of having your face on that platform. I ALSO received a phone call from a company looking for dietitians to participate in a 1-hour focus group in Beverly Hills. It was a cool experience and basically consisted of 10 dietitians having a roundtable discussion about oat products LOL. It went by fast and was a quick way to earn some extra cash as well. I’d totally do it again! Yahoo! I also doubled my monthly revenue for the FNL compared to August! I got 4 new annual members, plus payment from my regular recurring monthly members. My solution was to create monthly “mini e-courses” on specific topics. They would be available to purchase for $29 by anyone, but would automatically be included for any members of the FNL (which only cost $11.99/mo at the time). My hope was that it would encourage people to sign up for the library and that they would like the resource and remain members once they checked it out. This strategy actually worked pretty well, and was one of my main ways to get new members for a long time! You can tell that I launched an e-course at the end of the month, right?? As I mentioned above, this month I did my first sponsored post through Linqia (affiliate link)! As per usual, I had Gourmet Ads up on my site this month. It made me about $17. In September I had 8,635 pageviews, so that puts me at an RPM ($$ per 1,000 pageviews) of $1.97. That’s actually pretty low (meaning, even if I had 100,000 pageviews per month, I’d only be making $197 in ad revenue from Gourmet Ads). For some perspective, bloggers with larger traffic and better ad networks like Mediavine make RPMs of $10-$30 (so a blog with 100,000 pageviews would make $1,000 to $3,000 in ad revenue every single month). But whatever! My ads were FAR from optimized, and I hadn’t really put much effort into it. It was just some side money at the moment. Same story with Google Adsense! I had their ads up on my site, but wasn’t really do anything with them. I didn’t even have ads within the text, just in the header and side bar (and the side bar doesn’t even show on mobile… so I was probably losing money right there). Andddd finally, some of my clients ordered supplements via my Fullscript account and I earned some revenue from that. I’ve talked about this extensively in other income reports and this blog post, so I won’t really elaborate on it here! What else was going on in September 2017?? My boyfriend also turned 30 (woohoo! ), AND I applied for the Zing grant – a $500 to $1,000 grant for dietitians working on innovative business ideas. I applied in order to put the funds towards improving the Functional Nutrition Library and crossed my fingers!